Natural killer T (NKT) cells are the major early-acting immune cell type and fundamental immune modulators in ischemia-reperfusion injury (IRI). Because lymphocytes are exposed to various oxygen tensions under pathophysiologic conditions, we hypothesize that hypoxia-inducible factors (HIFs) have roles in NKT cell activation, and thus determine the final outcome of renal IRI. In this study, we used Lck-Cre transgenic mice to specifically disrupt HIF-2α in T/NKT cells and found that HIF-2α knockout led to upregulated Fas ligand expression on peripheral NKT cells, but not on conventional T cells. HIF-2α knockout promoted infiltration of NKT cells into ischemic kidneys and exacerbated IRI, which could be mitigated by in vivo NK1.1+ cell depletion or Fas ligand blockade. Compared with wild-type NKT cells, HIF-2α−/− NKT cells adoptively transferred to Rag1-knockout mice elicited more severe renal injury, and these mice were not protected by CGS21680, an adenosine A2A receptor agonist. Mechanistically, hypoxia-induced expression of adenosine A2A receptor in NKT cells and CGS21680-induced cAMP production in thymocytes were HIF-2α-dependent. Hydrogen peroxide-induced Fas ligand expression on thymic wild-type NKT cells was significantly attenuated by CGS21680 treatment, but this effect was lost in HIF-2α−/− NKT cells. 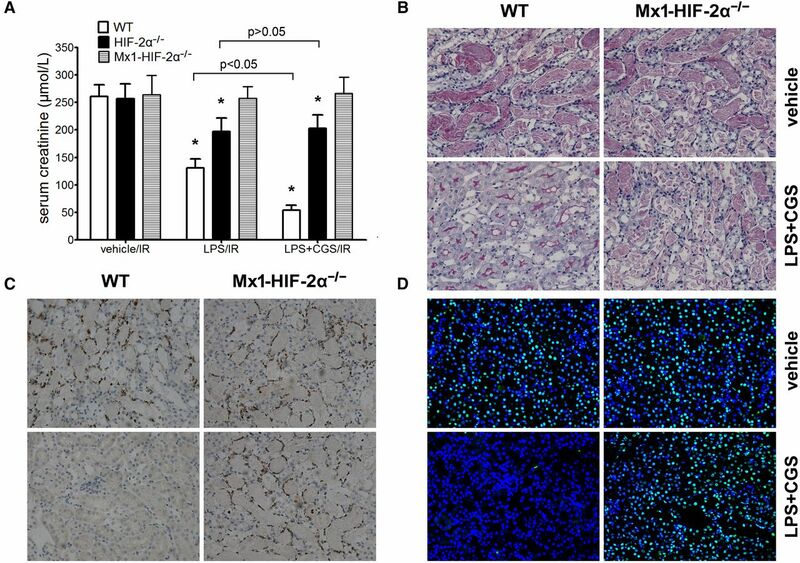 Finally, CGS21680 and LPS, an inducer of HIF-2α in endothelium, synergistically reduced renal IRI substantially, but this effect was absent in Mx1-Cre-induced global HIF-2α-knockout mice. Taken together, our results reveal a hypoxia/HIF-2α/adenosine A2A receptor axis that restricts NKT cell activation when confronted with oxidative stress and thus protects against renal IRI. Renal ischemia/reperfusion injury (IRI) has important implications in clinical transplantation. IRI is a multifactorial process, among which the inflammatory response is an important contributor.1,2 CD4+ T cell is a key player in the pathogenesis of renal IRI.3,4 T cell deficiency results in resistance to renal IRI, which can be restored by the adoptive transfer of CD4+ T cells.5,6 CD4+ T cells consist of functionally distinct subsets including conventional T cells and natural killer T (NKT) cells. In contrast to T cells, NKT cells respond to stress within hours, which makes them an ideal candidate to participate in the early immune response to IR. Previous studies7,8 revealed NKT cells to be the major early-acting CD4+ cell type in IRI, which regulated the function of other subsets of inflammatory cells, and thus served as a fundamental immune modulator in IRI. Lymphocytes frequently encounter a wide range of oxygen tensions given their highly mobile nature, and T/NKT cell responses in the context of inflammation are influenced by both hypoxia exposure9 and the expression of hypoxia-inducible factors (HIF),10 which are transcription factors regulating oxygen homeostasis. It has been shown that HIF-1α plays crucial roles in T cell survival and functions.11,12 However, the role of HIF-2α in T/NKT cells has not been explored. HIF-2α shares 48% identity with HIF-1α and is an important transcriptional regulator of hypoxic responses, controlling a variety of processes including EPO synthesis,13 lipid metabolism,14 iron homeostasis,15 vascular tumorigenesis,16 and macrophage function.17 Studies from our group18,19 and others20 have demonstrated that HIF-2α plays a key protective role in renal IRI, by preserving endothelial integrity and functions. However, whether HIF-2α in T/NKT cells plays a role in renal IRI still remains to be elucidated. In this study, we crossed the Lck-Cre mice21 with HIF-2α floxed mice and generated Lck-Cre+HIF-2αloxp/loxp (HIF-2α−/−) mice, to explore the role of T/NKT cell HIF-2α in renal IRI. Our results demonstrated that HIF-2α was very important in limiting NKT cell cytotoxicity in renal IRI. Various stress stimuli induce FasL expression on T/NKT cells and the in vivo cytotoxicity of NKT cells depends mainly on the Fas/FasL interaction.22 It was reported that blockade of the Fas/FasL interaction attenuated IRI both in the kidney23 and in the liver.24 So we isolated thymocytes, liver mononuclear cells (MNCs) and splenocytes, which were subjected to flow cytometry analyses. The results are summarized in Table 1, and a typical result is shown in Figure 1. Compared with the wild-type (WT) counterpart, HIF-2α−/− mice had relatively less NKT/T cells in the spleen and liver (but not in the thymus). NKT cells from HIF-2α−/− livers and spleens were characterized by much higher FasL expression. By contrast, FasL expression on conventional T cells or NK cells was not influenced by HIF-2α knockout (KO). Studies employing Mx1-Cre+HIF-2αloxp/loxp mice (overall HIF-2α KO) showed consistent results (Supplemental Figure 1). 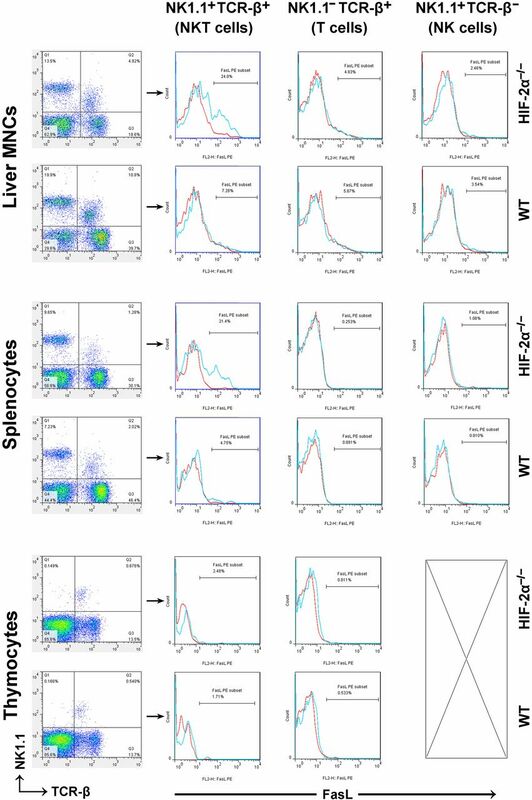 Proportion of lymphocyte subset and percentage of FasL+ cells in liver MNCs, splenocytes and thymocytes harvested from HIF-2α−/− mice and WT littermates. The mice received no previous treatments before the lymphoid organs were harvested. Single-cell suspensions were prepared as described in the Methods, and then stained with antibodies against NK1.1 (APC), TCR-β (FITC) and FasL (PE). Expression of FasL was analyzed on electronically gated NK1.1+TCR-β+(NKT), NK1.1–TCR-β+(T), or NK1.1+TCR-β–(NK) cells. Blue lines indicate the staining of FasL antibody, and red lines indicate the background staining with isotype-matched control IgG. Similar results were obtained in six independent experiments. HIF-2α−/− and WT mice were subjected to renal IR procedures. At 24 hours after reperfusion, the serum levels of creatinine (Cr) and BUN were evaluated and the results are shown in Figure 2, A and B. In the groups of 20 minutes of ischemia, HIF-2α−/− mice exhibited a significant increase in both Cr and BUN levels, suggesting exacerbated renal dysfunction. There was no statistical difference in the groups of 25 min of ischemia, probably because the renal damage had reached the highest limit, which equaled the level of mice subjected to bilateral nephrectomy (data not shown). Separate groups of mice were subjected to survival experiments. All WT mice survived the challenge of 20 minutes of ischemia. By contrast, only 30% HIF-2α−/− mice could survive (P<0.05, Figure 2C). The observations were reinforced by histologic evidence (Figure 2D). The effect of T-lineage cell HIF-2α inactivation on renal IRI. HIF-2α−/− mice and WT littermates were subjected to right nephrectomy, followed by 20 or 25 min of ischemia in the left kidneys. (A) Serum creatinine and (B) BUN concentrations at 24 hours after reperfusion were shown (n=8 per group). *P<0.05 versus WT mice. (C) Survival of HIF-2α−/− and WT mice after 20 min of renal ischemia (n=20 per group). HIF-2α KO led to a significant survival disadvantage by Kaplan-Meier analysis (log-rank test, P<0.05). (D) Representative PAS, MPO staining sections and TUNEL assay in post-ischemic kidneys harvested at 24 hours from the 20-minute groups are shown. Original magnification, ×200. Abnormalities based on PAS-stained sections were graded by a semiquantitative histomorphological scoring system from 0 to 4. PMN infiltration was scored on a scale of 1–4. A summary of the quantitative analysis of apoptotic cells per field was also presented. Data are expressed as mean±SD from six to eight animals per group. *P<0.05 versus WT mice in the 20-minute group. MPO, myeloperoxidase; PAS, periodic acid–Schiff. Renal sections were then subjected to immunohistofluorescence staining. As shown in Figure 3A and Table 2, the relatively mild ischemic challenge (20 minutes) promoted infiltration of few WT NKT cells into the ischemic kidneys at 3 hours after reperfusion. However, much more HIF-2α−/− NKT cells infiltrated into the kidneys at 3 hours and thereafter. In both groups, most infiltrating CD4+ cells were also NK1.1+, showing that NKT cells rather than conventional T cells dominated the immune responses. These observations were consistent with results from flow cytometry analysis of the renal inflammatory cells isolated at 3 hours after reperfusion. Moreover, the infiltrating NKT cells were fully activated because they were all FasL+ (Figure 3B). HIF-2α KO promoted infiltration of NKT cells into ischemic kidneys. (A) HIF-2α−/− and WT mice were subjected to 20 minutes of renal ischemia. Renal sections from sham-operated mice or ischemic kidneys harvested at 3, 6, and 24 hours after ischemic insult were stained with the indicated antibodies, followed by confocal microscopic analyses. Representative photographs are shown. Original magnification, ×200. Similar results were obtained in six independent experiments and summarized in Table 2. (B) HIF-2α−/− mice and WT littermates were subjected to 20 minutes of bilateral renal ischemia. Both kidneys were harvested at 3 hours after reperfusion and the infiltrating inflammatory cells were isolated by using CD45 microbeads, stained with antibodies against NK1.1 (APC), TCR-β (FITC) and FasL (PE), and subjected to FACS analysis, as described in the Concise Methods. The expression of FasL was analyzed on electronically gated NK1.1+TCR-β+ (NKT) cells. The blue line indicates the staining of FasL antibody, and the red line indicates the background staining with isotype-matched control IgG. Similar results were obtained in six independent experiments and a representative photograph are shown. These results suggested that HIF-2α−/− NKT cells responded much more actively and quickly to ischemic stress, and might be responsible for the exacerbated renal IRI. Because Lck-Cre recombinase led to gene KO in both conventional T cells (NK1.1–) and NKT cells (NK1.1+), to test the hypothesis that NKT rather than T cells contributed to the exacerbated IRI in HIF-2α−/− mice, we employed a monoclonal anti-NK1.1 antibody PK136.8 Treatment with PK136 substantially depleted NK1.1+ cells in the thymocytes, liver MNCs, and splenocytes as assessed by FACS analysis while leaving conventional T cell number intact (Figure 4A). Depletion of NK1.1+ cells reduced renal damage. More importantly, PK136 eliminated the difference between HIF-2α−/− and WT mice, and led to indefinite survival in all HIF-2α−/− mice (Figure 4, B–D). Because Lck-Cre-mediated gene targeting did not involve NK cells, these results suggested that NKT cells were responsible for the exacerbated renal IRI in HIF-2α−/− mice. In vivo NK1.1+ cell depletion eliminated the difference between HIF-2α−/− mice and WT littermates. Mice were injected intraperitoneally with 250 μg anti-NK1.1 monoclonal antibody (PK136) or isotype-matched control IgG2a at 48 hours before ischemic insult (20 minutes). (A) NK1.1+ cell depletion was confirmed by flow cytometry analysis. (B) Serum creatinine levels at 24 hours after the reperfusion (n=6 per group). *P<0.05 versus isogenic mice treated with control IgG. (C) Survival of mice after PK136/control IgG pretreatment and 20 minutes of renal ischemia (n=10 per group). 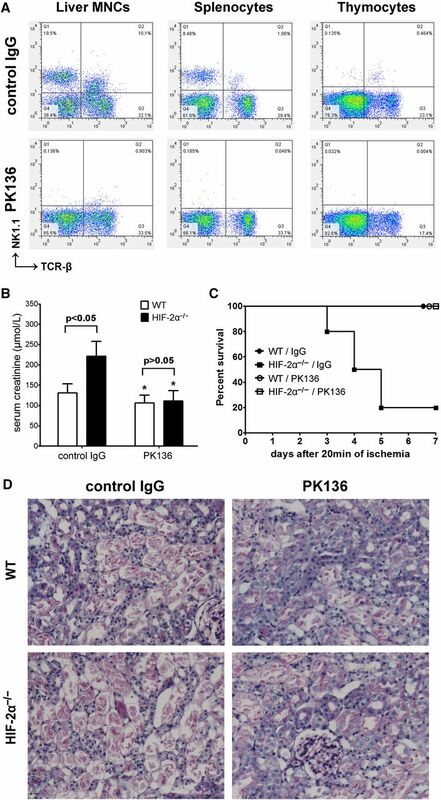 Compared with control IgG, PK136 led to a significant survival advantage in HIF-2α−/− mice by Kaplan-Meier analysis (log-rank test, P<0.05). (D) Representative PAS-stained sections in post-ischemic kidneys harvested at 24 hours. Original magnification, ×200. PAS, periodic acid–Schiff. As stated above, upregulated FasL expression was observed on HIF-2α−/− NKT cells, which infiltrated into post-ischemic kidneys aggressively. To determine the role of FasL in the exacerbated renal IRI in HIF-2α−/− mice, post-ischemic kidneys were subjected to immunoblotting analysis and a representative result is shown in Figure 5A, which revealed much higher FasL expressions in HIF-2α−/− kidneys. We next employed a FasL blocking antibody (FasL Ab) to determine whether FasL was a key causative factor. Compared with isotype control Ab, FasL Ab attenuated renal IRI in both groups. Moreover, FasL blockade eliminated the difference between HIF-2α−/−and WT mice (Figure 5, B–D). Renal samples from HIF-2α−/− mice harvested at 3 hours after reperfusion were also evaluated by immunohistofluorescence staining. As shown in Figure 5E, FasL Ab efficiently inhibited the infiltration of HIF-2α−/− NKT cells into ischemic kidneys. Expression of FasL in post-ischemic kidneys and the effect of FasL blockade on renal IR injury. (A) HIF-2α−/− and WT mice were subjected to 20 minutes of renal ischemia. Renal samples were harvested at 3, 6, and 24 hours after reperfusion. The kidneys from sham-operated mice served as controls. Expression of FasL was evaluated by western blot analysis and co-detection of β-actin was performed to assess equal loading (n=4 for each group at each time point). FasL protein bands were quantified and normalized to β-actin. *P<0.05 versus HIF-2α−/− samples. (B) The mice were subjected to FasL Ab or control Ab pretreatment and 20 min of renal ischemia. Serum creatinine levels at 24 h after the reperfusion were shown (n=6 per group). *P<0.05 versus isogenic mice treated with control Ab. (C) Survival of mice after FasL Ab/control Ab pretreatment and 20 min of renal ischemia (n=10 per group). Compared with control Ab, FasL Ab led to a significant survival advantage in HIF-2α−/− mice by Kaplan-Meier analysis (log-rank test, P<0.05). (D) Representative PAS-stained sections in post-ischemic kidneys harvested at 24 h. Original magnification, ×200. Abnormalities based on PAS-stained sections were graded and data are expressed as mean±SD from 6 mice per group. *P<0.05 versus control Ab-treated isogenic mice. (E) Renal sections from ischemic kidneys harvested at 3 hours after reperfusion were stained with the NK1.1 and CD4 antibodies, followed by confocal microscopic analyses. Representative photographs from HIF-2α−/− mice are shown. Original magnification, ×200. A summary of the quantitative analysis of double-positive infiltrating cells per field was presented. Data are expressed as mean±SD from 4 animals per group. *P<0.05 versus control Ab-treated HIF-2α−/− mice. PAS, periodic acid–Schiff. The protective effect of adora2a activation on IRI25 is based on compromised T/NKT cell activation.6,8 We next subjected HIF-2α−/− mice to an adora2a agonist CGS21680, followed by renal IR. As shown in Figure 6, CGS21680 lost effect in HIF-2α−/− mice, indicating that HIF-2α was necessary for the anti-inflammatory effect of adora2a activation. Consistently, CGS21680 also lost effect in Mx1-HIF-2α−/− mice (data not shown). The effect of CGS21680 on renal IRI in HIF-2α−/− mice and WT littermates. CGS21680 (0.7 mg/kg) or vehicle (DMSO) was administered intraperitoneally at 24 hours before renal IR. Then the mice were subjected to 20 or 25 minutes of ischemia as described above. (A) Serum creatinine concentrations at 24 hours after reperfusion (n=8 per group). *P<0.05 versus vehicle-treated WT mice. (B) Survival of HIF-2α−/− and WT mice after renal ischemia (n=20 per group). CGS21680 treatment led to a significant survival advantage in WT but not HIF-2α−/− mice by Kaplan-Meier analysis (log-rank test, P<0.05 between CGS21680 and vehicle-treated WT mice in 25 min ischemia group; P>0.05 between CGS21680 and vehicle-treated HIF-2α−/− mice in both 20 and 25 min groups). (C) Representative PAS-stained sections in post-ischemic kidneys harvested at 24 hours. Original magnification, ×200. Abnormalities based on PAS-stained sections were graded and data are expressed as mean±SD from eight mice per group. *P<0.05 versus vehicle-treated WT mice. PAS, periodic acid–Schiff. Cre recombinase specifically targeting NKT cells is not yet available, so we conducted experiments involving the adoptive transfer of NKT cells to congenic Rag1 KO (Rag1KO on C57B/6 background) mice that lacked lymphocytes including T/NKT cells.26 Using NK1.1+ iNKT Cell isolation kit, we isolated NKT lymphocytes from spleens, which were adoptively transferred into Rag1KO mice at 4 d before renal IR. Although both WT and HIF-2α−/− NKT cells reconstituted renal IR injury, the latter induced more severe damage. CGS21680 protected against renal damage when WT but not HIF-2α−/− NKT cells were transferred. The results of serum creatinine (Figure 7A) and BUN (data not shown) were consistent with periodic acid–Schiff-stained renal sections (Figure 7B). These findings suggest that HIF-2α was necessary to limit NKT cell cytotoxicity in renal IRI, probably by regulating adora2a expression and function in NKT cells. Adoptive transfer of HIF-2α−/− NKT cells elicited more severe renal IRI to Rag1KO mice than WT NKT cells, and HIF-2α−/− NKT cells were not responsive to CGS21680 treatment. NKT cells were isolated in a two-step procedure from HIF-2α−/− and WT mouse spleens. About 3×105 NKT cells were adoptively transferred into one Rag1KO mouse via tail vein injection at 4 days before CGS21680 treatment and renal IRI. (A) Serum creatinine concentrations at 24 hours after reperfusion (n=4 per group). Statistical significance or insignificance is indicated. (B) Representative PAS-stained renal sections from mice subjected to 20 minutes of ischemia and 24 hours of reperfusion are shown. Original magnification, ×200. Abnormalities based on PAS-stained sections were graded and data are expressed as mean±SD from four mice per group. Statistical significance or insignificance is indicated. PAS, periodic acid–Schiff. T cell receptor (TCR)-triggered FasL upregulation in T lymphocytes could be suppressed by adora2a activation.27,28 To determine whether adora2a was behind FasL upregulation in HIF-2α−/− NKT cells and the role of HIF-2α in adora2a expression, WT and Mx1-HIF-2α−/− mice were placed in air-tight chambers under normoxic (21% oxygen) or hypoxic conditions (10% oxygen). As shown in Figure 8, A and B, adora2a was constitutively expressed in thymocytes but not splenocytes. Hypoxia induced adora2a expression in splenocytes. However, adora2a could hardly be detected in Mx1-HIF-2α−/− thymuses or spleens. Splenocytes were then subjected to flow cytometry analyses, which showed that hypoxia treatment upregulated adora2a expression on WT NKT cells, which was almost absent in HIF-2α−/− NKT cells (Figure 8C). HIF-2 was previously shown to bind with high affinity to the promoter of adora2a.29 However, whether this was true in thymocytes has not been investigated previously. HIF binding activity to adora2a promoter was determined by electrophoretic mobility shift assay (EMSA) analysis using nuclear extracts from WT thymocytes. As shown in Figure 8D, only HIF-2α antibody was able to supershift the protein-DNA complex. These observations were consistent with the finding that HIF-2α was constitutively stabilized in the thymus (Supplemental Figure 2), and indicated that HIF-2 played a part in the expression of adora2a in the thymus. Hypoxia-induced adora2a expression in splenocytes, thymocytes, and NKT cells was dependent on HIF-2α. WT and Mx1-HIF-2α−/− mice were placed in air-tight modular incubation chambers either under normoxic (21% oxygen) or hypoxic conditions (10% oxygen) for 6 hours followed by 6 hours in 21% oxygen. Then spleens and thymuses were harvested. (A) Expression of adora2a was evaluated by western blot analysis and co-detection of β-actin was performed to assess equal loading (n=4 for each group). (B) Adora2a protein bands were quantified and normalized to β-actin. Data are expressed as means±SD. *P<0.05 versus the WT controls. (C) Single-cell suspensions were prepared from spleens. After the fixation and permeabilization step, the expression of adora2a was analyzed on electronically gated NK1.1+TCR-β+ (NKT) cells. Blue lines indicate the staining of adora2a antibody, and red lines indicate the background staining with isotype-matched control IgG. Similar results were obtained in four independent experiments. (D) Thymuses were harvested from normoxia or hypoxia-treated WT mice and nuclear extracts were isolated and subjected to gel mobility shift assays using a probe from mouse adora2a promoter sequence. HIF-1α or HIF-2α antibodies were added to the reaction to generate supershifts. The protein-DNA and supershifted complexes are indicated, respectively. Adora2a activation stimulates intracellular cAMP production and functions through it.30 As shown in Figure 9A, CGS21680 induced much more cAMP production in thymocytes than in splenocytes or liver MNCs, which was consistent with the observation that the thymuses had much higher adora2a expression (Figure 8A). The cAMP increase in thymocytes was markedly attenuated by HIF-2α KO. However, the cAMP increase in splenocytes and liver MNCs was abrogated only in Mx1-Cre-mediated HIF-2α−/− cells, probably because the spleen and liver contained immune cells other than T/NKT cells that were not responsive to Lck-Cre-mediated gene disruption and thus could still respond to CGS21680 treatment. CGS21680-induced cAMP production and FasL inhibition in HIF-2α−/− and WT immune cells. (A) WT, HIF-2α−/− and Mx1-HIF-2α−/− mice received no previous treatments before the splenocytes, liver MNCs and thymocytes were prepared and treated with CGS21680 (10 μmol/L) or vehicle (DMSO). Intracellular cAMP level was determined by ELISA. *P<0.05 versus vehicle-treated controls. #P<0.05 versus CGS21680-treated WT thymocytes. (B) CGS21680 or DMSO was added to thymocyte suspensions at 1 hour before H2O2 (25 μmol/L) or PBS was added. Four hours later, the expression of FasL was analyzed on electronically gated NK1.1+TCR-β+ (NKT) cells. Blue lines indicate the staining of FasL antibody, and red lines indicate the background staining with isotype-matched control IgG. Similar results were obtained in four independent experiments. As stated above, HIF-2α KO increased FasL expression on peripheral NKT cells. To determine whether this was a result of compromised adora2a expression/activation, we employed an in vitro model simulating oxidant stress by hydrogen peroxide in a similar fashion to previous reports.31 Because thymic NKT cells from both HIF-2α−/− and WT mice were FasL-negative without treatment (Figures 1 and 9B), thymocytes were used. CGS21680 was added to the culture medium of thymocytes, which were then subjected to stimulation by hydrogen peroxide. As shown in Figure 9B, hydrogen peroxide significantly promoted FasL expression on HIF-2α−/− and WT NKT cells. However, CGS21680 attenuated FasL expression on WT but not HIF-2α−/− NKT cells. These results suggested that the upregulated FasL expression on peripheral HIF-2α−/− NKT cells might be a result of adora2a deficiency and irresponsiveness to endogenous adenosine. We previously demonstrated that LPS induced endothelial HIF-2α, which protected against ischemic injury.19 In this study, a combination of LPS/CGS21680 reduced the renal injury to a surprising extent in WT mice, but had no effect in Mx1-HIF-2α−/− mice (Figure 10). 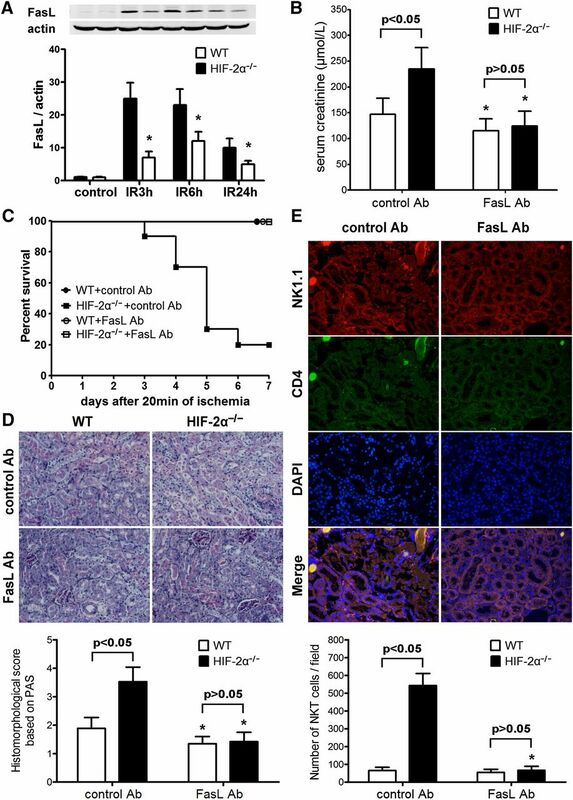 These results highlight the role of HIF-2α as a key protector in renal IRI, by both preserving endothelial function and reducing inflammation. The synergistic effect of CGS21680/LPS against renal IRI in WT, HIF-2α−/− and Mx1-HIF-2α−/− mice. CGS21680 (0.7 mg/kg) and LPS (3 mg/kg) were administered intraperitoneally together. Twenty-four hours later, the mice were subjected to right nephrectomy and 25 minutes of ischemia in the left kidneys, followed by 24 hours of reperfusion. (A) Serum creatinine concentrations (n=6 per group). CGS21680/LPS treatment failed to reduce creatinine level in Mx1-HIF-2α−/− mice (P>0.05 versus vehicle-treated mice). *P<0.05 versus vehicle-treated controls. Representative (B) PAS, (C) MPO staining sections and (D) TUNEL assay in post-ischemic kidneys harvested at 24 h after reperfusion. Original magnification, ×200. MPO, myeloperoxidase; PAS, periodic acid–Schiff. There is increasing recognition that ischemia/hypoxia may not only impair cellular energy production, but also has a regulatory impact on cellular functions. Central to hypoxia adaptation are HIFs, which have many target genes and generally increase oxygen delivery and/or improve cell survival in conditions of limited oxygen availability. However, the impact of HIF induction on the functions of specific cell types must be determined specifically. It was reported9 that T cell function was highly dependent on their localization and the extent of T cell activation and proliferation was decreased in environment with low oxygen tension.44 This was in line with our observation that adora2a expression/activation paralleled with hypoxia/HIF-2α in lymphoid organs, and suggested that the hypoxic environment and constitutive HIF-2α stabilization might be partially responsible for the relatively stable and immune-privileged environment in the thymus. Moreover, given the fact that tissue inflammation/destruction is always accompanied by prolonged local hypoxia, our results also suggest that hypoxia/HIF-2α/adora2a axis may serve as a molecular “brake” system to control undue inflammation through its effect on NKT cells. It was reported27,28 that adora2a activation in T cells could inhibit their FasL expression and cytotoxicity. However, no reports correlated adora2a activation with FasL inhibition in NKT cells. We found that adora2a expression in thymocytes, splenocytes and NKT cells was HIF-2α-dependent. However, HIF-2α KO-induced FasL overexpression was observed in peripheral NKT cells but not in T cells. Why? As we know, T/NKT cell activation, and FasL upregulation as a result, is a TCR-triggered event. T cells have highly variant TCRs specific for numerous peptide antigens. A lack of FasL expression in HIF-2α−/− T cells might only reflect that no peptide presentation was happening given the fact that the mice were healthy and not being subjected to infections. Although like T cells, the interaction between the NKT TCR and the antigen-CD1d complex also represents a central event leading to NKT cell activation, NKT cells are typically characterized by the expression of a semi-invariant TCR which can bind to a diverse array of chemically distinct antigens45 and function like “pattern-recognition receptors” in engaging a variety of lipid-based antigens like microbial lipid antigens46–49 and self-lipid antigens.50 Moreover, NKT cells do not require ongoing interactions with CD1d for activation and proliferation.51,52 So, the characteristic semi-activated basal state of NKT cells makes them quite different from conventional T cells and may explain why the former rather than the latter become activated and increase FasL expression on the background of HIF-2α/adora2a deficiency. These data thus demonstrate a previously unrecognized mechanism underlying the restriction against NKT cell activation in vivo, which is important in the context of renal IRI, and may be even more important in other circumstances, for example, the hypoxic conditions in solid tumors which escape from immunosurveillance. Finally, our findings are of clinical importance. LPS (an inducer of HIF-2α in endothelium) produces a synergistic effect with CGS21680, and reduces renal IRI to a surprising extent. Although a combination of LPS and CGS21680 is not applicable in clinical medicine, to find pharmacological agonists targeting both endothelial and NKT HIF-2α seems to be a promising drug development strategy and may prove to be highly effective in the treatment of renal IRI. In conclusion, our results shed light on how hypoxia is correlated with adora2a expression/activation in NKT cells and provide new insight into the potential cellular and molecular mechanisms regulating inflammation in the setting of ischemic renal injury. The Cre/loxP recombination system was used to generate HIF-2α KO mice, as described previously.19 Lck-Cre (stock number: 003802), Mx1-Cre (003556) transgene mice, HIF-2α floxed mice (008407), as well as Rag1KO mice (002216) were all from The Jackson Laboratory (Bar Harbor, ME). The mating strategy, genotyping and the confirmation of target gene excision are described in the Supplemental Material. A typical genotyping result is shown in Supplemental Figure 1 to show target gene excision in multiple lymphoid organs and purified NKT cells. Male mice, 8–14 weeks of age and weighing 20–28 g, were used in the present study. All animal experiments were conducted according to NIH guide for the care and use of laboratory animals and the institutional guidelines of Shanghai Jiaotong University School of Medicine. All the procedures described were approved by the Animal Use and Care Committee of Shanghai Jiaotong University School of Medicine (approval number: SYKX-2012–0013). A warm renal IR model was used as described.18 The selective adora2a agonist, CGS21680 (0.7 mg/kg, dissolved in DMSO; Sigma-Aldrich, St. Louis, MO) was administered intraperitoneally at 24 h before renal IR. In some experiments, CGS21680 was given together with LPS (3 mg/kg, intraperitoneally, from Escherichia coli serotype 055:B5; Sigma-Aldrich). The details of the surgical operation and the application of pharmacologic agents are described in the Supplemental Material. Some mice were placed in air-tight modular incubation chambers (Shanghai Alcott Biotech Co. Ltd., China) and the atmosphere was controlled by a constant gas flow (1.5 L/min) containing 21% or 10% O2. Single-cell suspensions from spleens and thymuses were prepared by running specific gentleMACS programs on a gentleMACS dissociator (Miltenyi Biotec, Bergisch Gladbach, Germany), according to the manufacturer’s optimized protocols. Liver MNCs were prepared by using the gentleMACS dissociator according to the manufacturer’s protocol and a previous report,53 with modifications. Isolation of the infiltrating inflammatory cells from the ischemic kidneys was achieved by running specific gentleMACS programs on the gentleMACS dissociator, followed by positive selection using CD45 microbeads (130–052–301; Miltenyi Biotec). The details are described in the Supplemental Material. The cell suspensions were incubated with anti-mouse CD16/CD32 blocking antibody prior to staining. Then, samples were labeled using combinations of the following antibodies: anti-NK1.1 APC (17–5941; eBioscience, San Diego, CA), anti–TCR-β FITC (11–5961; eBioscience), anti-FasL PE (12–5911; eBioscience) or anti-adora2a PE (sc-32261; Santa Cruz Biotechnology, Dallas, TX). When adora2a was detected, antibodies were added to the samples after the fixation and permeabilization step by using the intracellular fixation and permeabilization buffer set (88–8824; eBioscience) according to the manufacturer’s protocol. Immunofluorescence staining was analyzed using a FACSCalibur instrument (BD Biosciences, San Jose, CA). The lymphocytes were gated using forward and side scatter to exclude debris and dead cells, and then 30,000 events were acquired in each assay for analysis. In some experiments, CGS21680 (10 μmol/L) or DMSO (vehicle) were added to the culture medium of thymocytes at 1 hour before H2O2 (25 μmol/L) was added. Four hours later, the cells were labeled with the antibodies (NK1.1, TCR-β and FasL) and subjected to FACS analysis. NKT cell isolation was performed in a two-step procedure from mouse spleens using a commercially available NK1.1+ iNKT Cell Isolation Kit (130–096–513; Miltenyi Biotec), according to the manufacturer’s protocols. Typically, this method produced cell populations of >90% NKT cells from splenocytes (Supplemental Figure 3). About 3×105 NKT cells (from four to six mice) were adoptively transferred into a Rag1KO mouse via tail vein injection at 4 days before renal IRI. Successful reconstitution was confirmed by FACS analysis of splenocytes collected at 24 hours after reperfusion. Control animals received vehicle injections. The details are described in the Supplemental Material. To deplete NK cells and NKT cells, mice were injected intraperitoneally with 250 μg anti-NK1.1 mAb (PK136, M100N2–14F; Sungene Biotech Co., Tianjin, China) or isotype-matched control IgG2a (control IgG) 48 hours before renal IR insult. The depletion of NK1.1+ cells was confirmed by flow cytometry analysis after the experimental procedures and sacrifice of the mice. This protocol produced a >90% decrease in the number of the indicated cells. FasL blockade was implemented by in vivo administration of a functional-grade purified anti-mouse FasL antibody, as previously described.23 Anti-FasL Ab (16–5911; eBioscience) or control hamster IgG (control Ab) were injected intraperitoneally (500 μg per mouse) at 24 hours before IR insult, and a booster injection at half dose was administered immediately after the initiation of reperfusion. After incubation with primary antibodies for anti-CD4 and NK1.1 (1:100; Novus Biologicals, Littleton, CO) overnight at 4°C, the paraffin-embedded renal sections were washed with PBS three times and incubated with FITC conjugated secondary donkey anti-rabbit IgG (1:200) and cyanin 3 (Cy3) conjugated secondary donkey anti-mouse IgG (1:300, both from Wuhan goodbio technology Co., Wuhan, China) for 1 hour at room temperature in a darkened humidified chamber. Finally, the preparations were washed with PBS and mounted with fluorescent mounting medium containing 4ʹ,6-diamidino-2-phenylindole (Beyotime Institute of Biotechnology, Shanghai, China). Each section was observed under a confocal laser scanning microscope at a magnification of ×200. Intracellular cAMP level was detected by using a Monoclonal Anti-cAMP Antibody-Based Direct cAMP ELISA Kit (NewEast Biosciences, Malvern, PA), as described previously.54 The details are described in the Supplemental Material. Serum creatinine (Cr) and BUN levels were measured via a standard clinical automatic analyzer (Siemens Dimension Xpand; Dade Behring, Marburg Germany). Paraffin-embedded kidney tissues were stained with periodic acid–Schiff, processed for immunohistochemical localization of myeloperoxidase, or subjected to TUNEL assay. Details are in the Supplemental Material. Western blot analyses of HIF-1α (NB100–134; Novus Biologicals), HIF-2α (ab199; Abcam, Inc.), adora2a (sc-13937; Santa Cruz Biotechnology) and FasL (ab15285; Abcam, Inc.) were performed as described previously.18 Detailed procedures are described in the Supplemental Material. Protein-DNA interaction was detected by using an Odyssey Infrared EMSA Kit (LI-COR, Lincoln, NE), according to the manufacturer’s protocols. Briefly, nuclear extracts from thymuses were assembled with a DyLight 680-labeled double-stranded DNA probe (Takara Co., Dalian, China) from mouse adora2a promoter sequence, which was located about 34 bp upstream of mouse adora2a exon 1, as described by a previous report.29 The sense sequence was 5′-GGACGCGTGGACCTGAAGCGCCCACGTTGGGG-3′. The signal was detected and quantified with Odyssey infrared imaging system (LI-COR). Supershift assays using HIF-1α or HIF-2α antibody were also conducted to confirm the specificity of HIF/DNA-binding activity. The details are described in the Supplemental Material. All values were reported as means±SD. Data were analyzed by one-way ANOVA with a subsequent Student–Newman–Keul’s test, or a t test where applicable. Statistical significance was set at P<0.05. This work was supported by grants from the National Natural Science Foundation of China (grant number: 81470895) to M.Z. and (grant number: 81270558) to Q.X. J.Z., C.H., H.D., and J.H. contributed equally to this work. This article contains supplemental material online at http://jasn.asnjournals.org/lookup/suppl/doi:10.1681/ASN.2014121248/-/DCSupplemental.